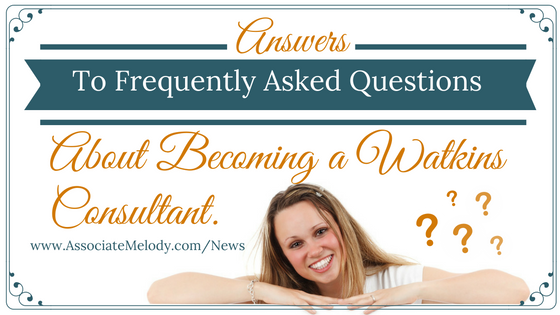 The most frequently asked questions about joining Watkins as a Consultant. It’s great that you have questions. Here are the answers to the most frequently asked questions about joining Watkins as a Consultant to buy at a discount or start your own Watkins home-based business. Click/tap on a specific question to see the answer or scroll down the page to read them all. By the way, I love people who have questions! How much money can I make with Watkins? How does Watkins pay me? Do I have to meet monthly sales quotas to continue being a Consultant? Do I get a website? How expensive is it to start a Watkins Business? 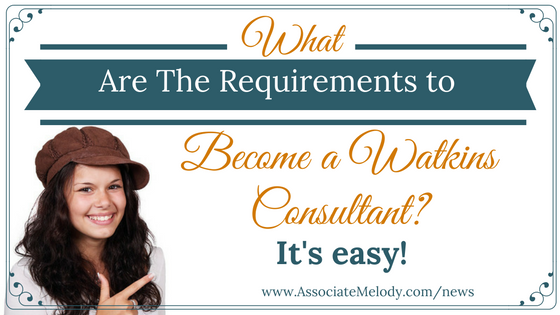 What are the requirements to become a Watkins Independent Consultant? How long will it take me to start earning money? How many other people must I sponsor? What if I don’t have the money to get started? Can I use my business for tax write-offs? Will I be allowed to advertise my business? Will I need to keep inventory? How can I get catalogs and other promotional materials? Yes. When you become a Watkins Consultant you set your own hours, whether part or full-time. Many people choose to keep their full-time time jobs while supplementing their income selling Watkins products. It is the perfect income opportunity for stay at home, work at home Mom’s or Dad’s or for retiree’s to supplement their family’s income while still enjoying their current lifestyle. How much money do you want to make? You can earn commissions of up to 35% on your retail sales volume, and you may also earn achievement bonuses of approximately 3 to 12 % more. This increases as you grow your business and progress through each level of achievement. You also earn bonus income on the sales of Consultants you sponsor, if you decide to sponsor anyone. Promote to Manager and you’ll have the opportunity to earn up to $6000.00 (US) in bonuses in your first year at that level. I’m unable to make specific income claims as what you earn will be based on your efforts and actions. Your income potential is only limited by your drive and creativity to sell the products. How does Watkins pay me? How do I earn income? When you place a qualified order you’ll receive an immediate discount, this is your commission. When you place more than one order in a calendar month Watkins adds up your sales for the month and recalculates your commission based on your total month’s sales volume. 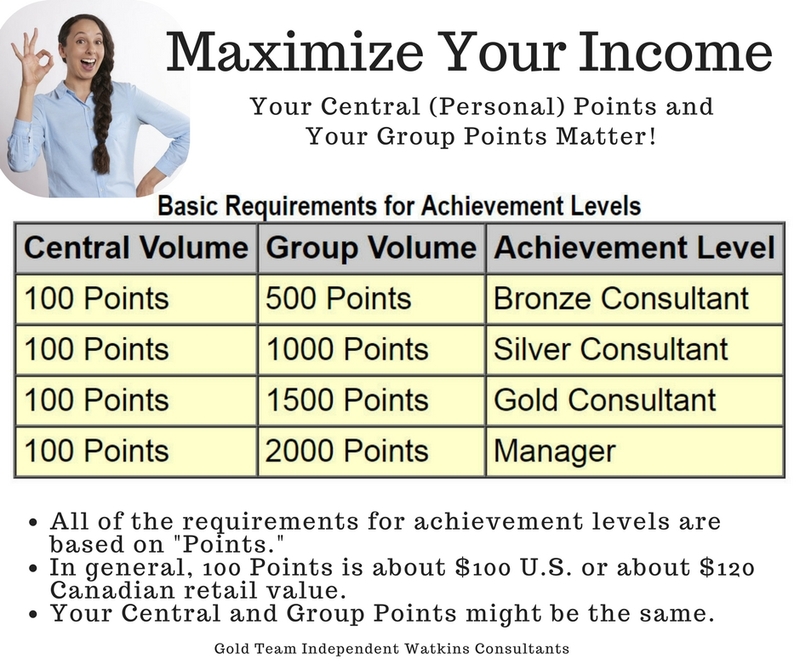 You may also qualify for bonus income based on your group’s volume. Then, when you’ve earned commission and bonuses Watkins will pay you by direct deposit or mail you a check around the 10 of the month for any additional income you earn once a month. The two main ways you earn income is through retail sales and achievement bonuses. We teach you how to maximize your value and increase your income with smart business strategies and tactics. No, absolutely not. Watkins places no quotas or sales requirements on you in order to keep your membership. You simply order the products you want, for yourself and/or your customers whenever you want. Your Watkins Membership Package only costs $29.95. That’s not much when you consider the costs involved in starting up most businesses. The marketing strategy you wish to pursue will determine how much more you’ll need to invest to get started. After one year, you’ll also need to pay an annual fee of$29.95 to maintain your Watkins membership. To help you get off to a great start, we recommend that you purchase a package of catalogs, customer order forms, and some products to use as samples, to display, resell or use yourself. I’ll be happy to assist you with putting together your first order based on your personal preferences and goals. 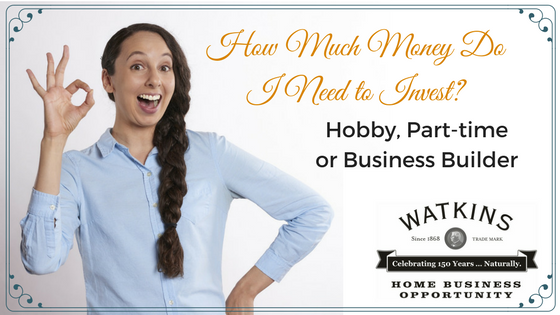 For more details check out How Much Money Do I Need to Invest to Start a Watkins business? Yes, you will actually receive two personalized websites included with your membership at no extra charge. You’ll have your own www.RespectedHomeBusiness.com site which is like an online brochure about the Watkins business opportunity, so people can learn about what Watkins offers and join your team. Plus, you’ll have a personal site www.Watkins1868.com/thacker like mine for people who want to order products and each site links to the other. Best of all, both of these sites are set up for you so you don’t need any technicals skills or knowledge. What are the requirements to become a Consultant with the Watkins Company? You need to buy a Watkins Membership Package (cost is only$29.95 plus tax), be at least 18 years of age, a citizen of the U.S. or Canada and have a valid Social Security or Federal ID number. Learn more about the requirements and how easy it is to become a Watkins Consultant here. You can learn about Watkins products and marketing strategies in the comfort of your own home at your own pace. Watkins “System For Success” will walk you through step by step with a simple, yet comprehensive direct sales training program. Our two support websites offer up to date training materials, step by step guides and tools. Your leadership team is here to help you, I also offer a six-week training program for new Consultants, a toll-free number to call for assistance, a private support community on facebook, e-mails etc. I am always happy to provide you with any extra training materials you want. Watkins leaders provide conference calls, webinars, training meetings, and videos, all of these are of course optional. You can earn income with your very first order, since you order products at a discounted or wholesale price and charge customers the retail price. So, it’s really up to you as to how fast and how much income you earn. No, we don’t hold physical meetings. Our team offers conference calls, online training classes, and seminars for your convenience. These events are optional but helpful in understanding and building your business so I highly recommend you watch the recordings if you can’t attend. Watkins does not require you to sponsor anyone. However, if you choose to sponsor others, the opportunity to grow your business, build a marketing team and earn bonus income is there for you. There are no limits on the number of people you can sponsor. The small cost of starting your own Watkins business should not stand in the way of your future! If you are really serious about starting a Watkins business and willing to invest a bit of your time, we’ll show you how to earn the cost of your membership package for free. Yes. Now we aren’t tax experts, however, if you are genuinely trying to run a home based business you will be able to deduct business expenses from your income. We’ll try to direct you to the appropriate resources once you’ve joined. Yes, you may promote or advertise your Watkins business in a variety of ways as long as you identify yourself as an Independent Watkins Consultant. 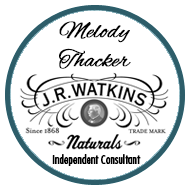 You may use Watkins current logos and name if you wish to create your own marketing materials. Naturally, you’d be expected to conduct yourself in an honest and professional manner. Like all direct sales companies, Watkins has marketing policies in place for Consultants which enables you to benefit from being able to align yourself with the Watkins company’s respected name. Maybe. Watkins doesn’t require Consultants to purchase any inventory. However, the marketing strategy you choose will determine whether or not you need to carry any inventory. For example, if you use vendor events (markets, fairs, festivals, bazaars, shows) to market the products obviously you’d need products to display and sell at your events. If you decide to market through party plan you’ll want a few products to display and use for demonstrations or sampling. For the most part, you will not need to carry much inventory as your customer orders can be fulfilled fairly quickly, usually within a week. Watkins processes and ships orders quite quickly, depending on how far you live from our distribution centers in Minnesota, US or Ontario, Canada most orders are delivered within 5-8 business days. In the U.S., please allow approximately 5-10 business days for delivery. Orders in Canada, please allow approximately 4-14 business days for delivery. Orders shipping to Alaska, Hawaii, Puerto Rico, Guam, Virgin Islands, or APO/FPO addresses, please allow 2-3 weeks for delivery. Watkins primary shipping carriers are UPS or DHL Smartmail (for orders under 12 pounds) in the US. Purolator and Canada Post for Canada. Carrier selection is by the discretion of the Watkins company. Party plan is one of the marketing strategies you may use to build and grow your business. It’s one of the best ways to manage your time, earn immediate income and grow your business. However, you are not required to use party plan and may choose one of the other marketing strategies. Watkins accepts all major credit cards (and debit/bank cards in the US) as well as checks/cheques and money orders by mail. Once you’ve joined you will also have the option of setting up a quick pay account (Automatic Checking Account Payment). Watkins offers catalogs, promotional and business support materials for Consultants to order at a very reasonable price. Our beautiful, full product catalogs cost about 50 cents each which is an outstanding value for this essential marketing tool. You can order catalogs whenever you are placing a product order. Many promotional materials are also available as free downloadable documents on our support websites. 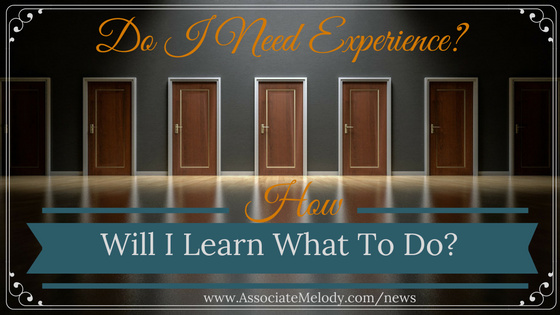 I’m here to answer all your questions, just call me, Melody toll-free at 1-866-452-6948 and I’ll be happy to assist you. Are you ready to join Watkins? Wonderful! The sooner you join us the quicker you’ll be able to start shopping at a discount or earning income and building your business. I look forward to assisting you! Looking for dealer in Skagit county. Thank you for asking Brenda, I don’t think we currently have anyone on our team near enough to you. Skagit county is a pretty big area so feel free to call toll-free 1-866-452-6948 to see if we have a Washington Consultant near you.